The weak Chinese economic data sent US stocks careening lower last week as investor pessimism increased even though estimates for Q4 GDP growth increased. The Atlanta Fed GDP Nowcast changed from expecting 2.4% growth to 3% growth. This tracking estimate gets more accurate as the preliminary GDP estimate comes closer to being released. The issues with China shouldn’t be surprising, but they still affected markets. China’s growth has been slowing for years, with only a slight uptick in 2017. There were some solid economic reports earlier this year because firms increased their business before tariffs were implemented. In that case, the tariffs actually boosted growth temporarily. 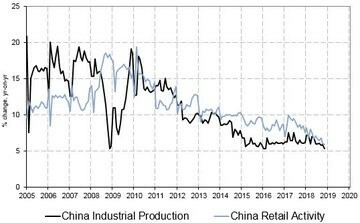 Now that the increased demand is over, China’s economy is once again enduring the wrath of their economic slowdown combined with the added anchor of US tariffs to deal with. As you can see from the chart below, both industrial production and retail activity growth have been slowing in the past few years. November industrial output was up 5.4% year over year which missed estimates and October’s growth rate of 5.9%. This is the slowest growth since January to February 2016. Growth started the year at its year to date high point which was 7.2%. Retail sales growth was 8.1%, which would be amazing for America, but is poor for China which is a developing economy. Retail sales growth was expected to be 8.8% which would have been an increase over the 8.6% growth in October. Growth fell sharply instead of increasing modestly. Economists were wrong on that prediction. They didn’t consider the temporary increase caused by the tariffs. At this pace of deceleration, Chinese economic growth will soon be in the range America has grown at this cycle. Goldman Sachs expects Chinese GDP growth in 2019 to slow from 6.6% to 6.2% even though China is cutting taxes as a stimulus measure. The only modest positive from this group of metrics is fixed asset investment for the first 11 months of the year was up 5.9%, instead of 5.8%. It accelerated from the 5.7% growth in the first 10 months of 2018. The purpose of UPFINA is to improve our understanding of economics and finance by evaluating all perspectives and facts as they change. There are many more factors than we can review in any one specific article.